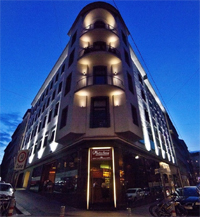 Welcome to Flatschers Restaurant and Bar in Vienna’s 7th district that now carry our Hoepler K7 and Hoepler Riesling. A local restaurant that combines a feel good ‘buzz’ with international cuisine. Flatschers is famous for its steaks and American burgers but also offers great Viennese ‘gemutlichkeit’ (cosiness) too. Give it a go.